With summer just around the corner, traffic jams may be plentiful when it comes to finding your way to the beach. But today’s blog jam isn’t in the street! Terri Guillemets reminds us that “Strawberries are the angels of the earth, innocent and sweet with green leafy wings reaching heavenward.” That’s giving this fruit quite the headline. And if you haven’t noticed, it’s strawberry prime time. Are you sticking to the usual garden plantings - tomatoes and cukes? Maybe you think that sweet, tasty strawberries only grow in rows and rows of great soil. Well, think again. These strawberry plants got tossed in between the cracks of our stone landing and the terrace and still, perfectly shaped fruit is popping through. Thinning and weeding out our large strawberry patch last fall meant many plants took to the wayside. Still, a number of them are sprouting in the strangest of places. It may not be enough to produce a jam or jelly but there’s nothing like the taste of a fresh strawberry. So if you decided that growing strawberries aren’t worth your trouble, think again. Strawberries are simple to produce, even in tiny clay strawberry pots. If you’re still not convinced, at least schedule a trip to one of the local strawberry u-pick it farms in your neighborhood. Remember, as the season turns from spring to summer, the jam isn’t in the street. It’s in your garden or local farm stand. 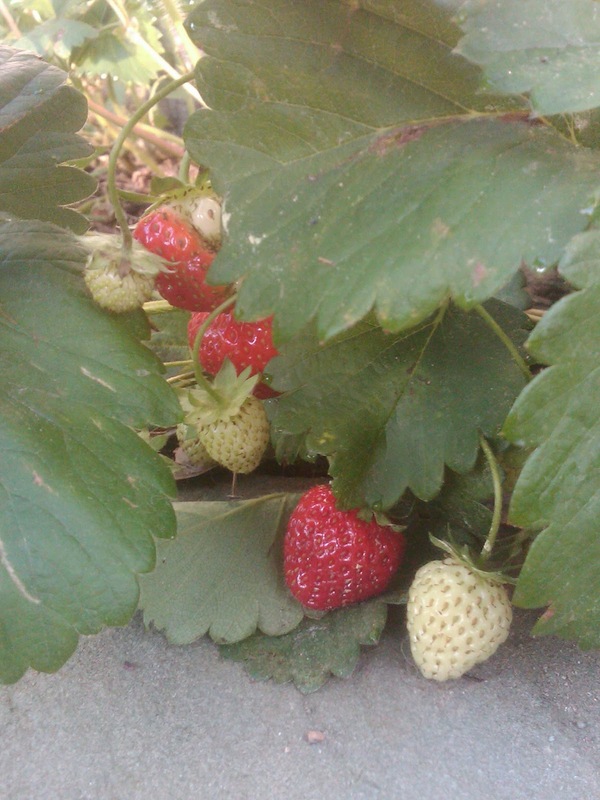 Don’t miss this week’s headliner - strawberry production time. Peak season for the delectable and sweet! P.S. Share your favorite strawberry recipes. Even great in smoothie drinks!